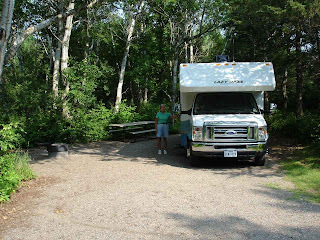 After a very pleasant stay at Michigan's Harrisville State Park on Lake Huron, we headed further south on the east shore of the Lower Peninsula. Since we needed a laundromat and a Bank of America( no such thing in upper Minnesota, Wisconsin, and UP of Michigan), we headed for Frankenmuth. A very pretty and friendly town. They list their town as a Bavarian town and celebrate festivals in Bavarian costume. The campground was out of town and through the cornfields. 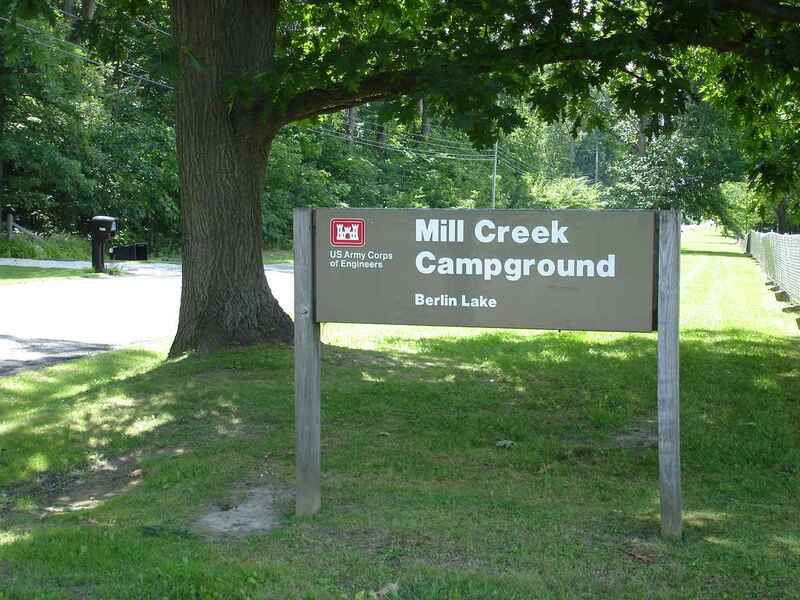 Listed as a regular campground, it was a church affiliated campground, well laid out, with all kinds of dorm buildings, fields, dining halls, etc. A part of the property was set aside for visiting campers. We enjoyed a very quiet evening on our 15% Escapee discount. Our next leg of our trip was to bypass Flint and Detroit, Michigan as well as Toledo, Ohio. Turned out to be not a bad drive at all. Either we missed rush hour traffic or it's not that hectic. 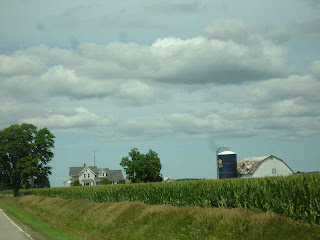 Typical of our back roads in lower Michigan and Ohio are some beautiful farm properties. Field after field of tall corn and other vegetables. The farm houses and other buildings are generally well cared for. Again, the roads we are traveling have no turnouts or breakdown lane, so it is difficult to stop and take a picture. Much of the property outside of the towns is farm property. In Ohio, we noted ,on a news coverage of a local fair , that an award was given to a local farm family that was celebrating 200 years of production on their farm. 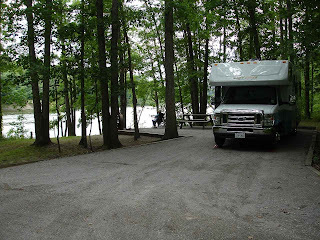 We found our laundromat in a private campground in Huron, Ohio on the Huron River. 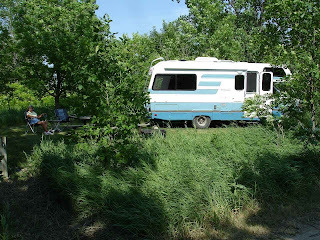 It was interesting to be in a campground where there are a number of seasonal campers. 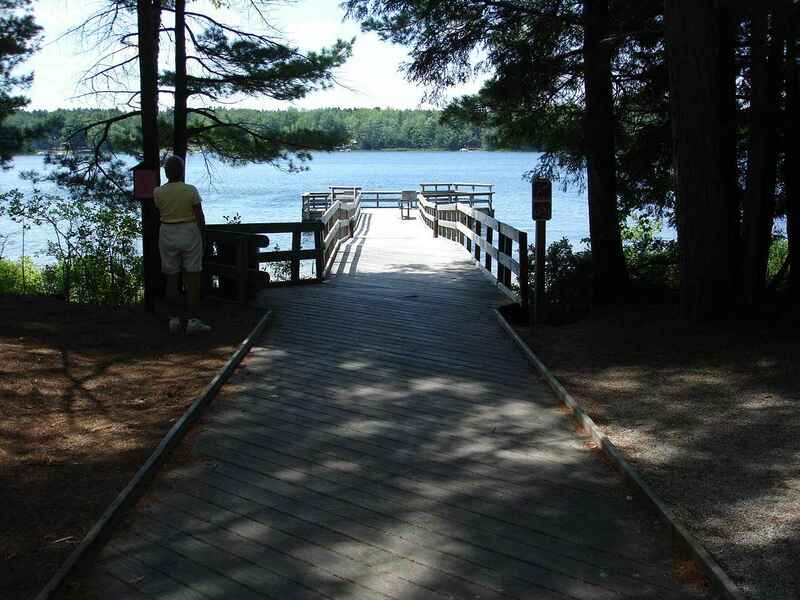 Many sites had boat docks right in front of their campsite with some pretty large pleasure, fishing, and pontoon boats. 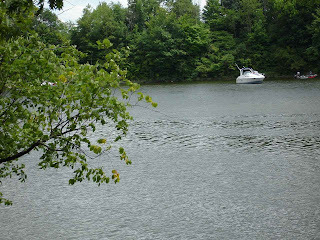 From their boatdock, it was an easy trip right out to Lake Erie. 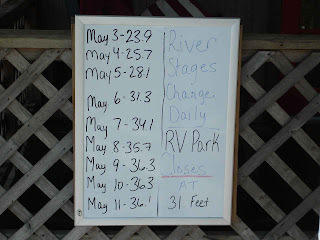 Fascinating also to note that most seasonals had golf carts, even though the campground was relatively small in area. On the weekend many had parties and campers would go from one site to another to sit around the fire and gab. Very friendly place. It was on our Passport America list which meant that we only paid 50% of the stated overnight fee. 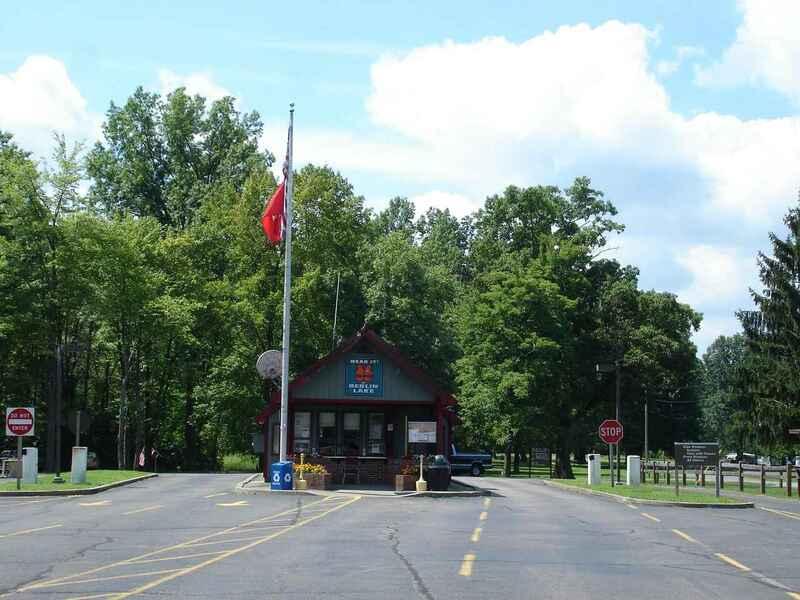 From Huron, we slipped south of Cleveland to the eastern border of Ohio and Ohio's only Army Corps of Engineer Park. 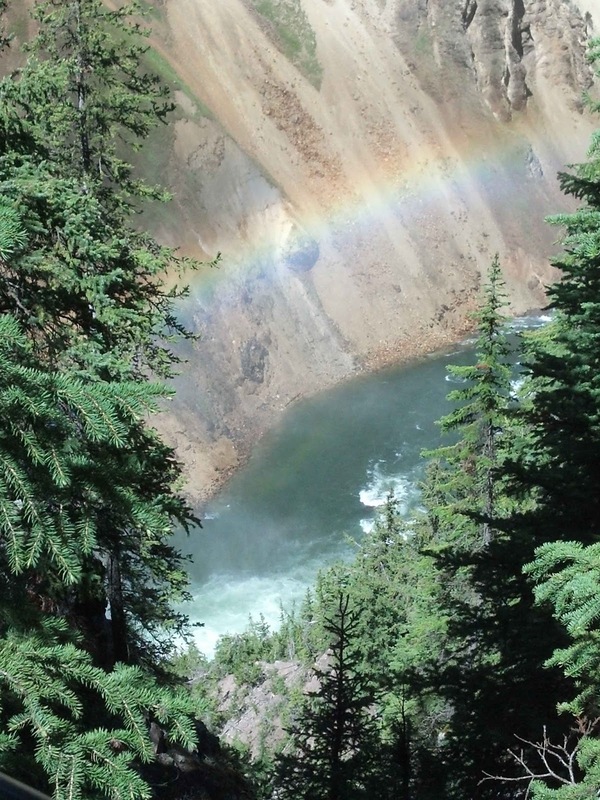 Many states in the west have few or no Corps parks. As old folks, we love to use our America the Beautiful Senior Pass to camp at half price in Corps parks as well as the National Forest Parks. Located in Berlin Center, south of Youngstown, Mill Creek Campground is a large Corps park. 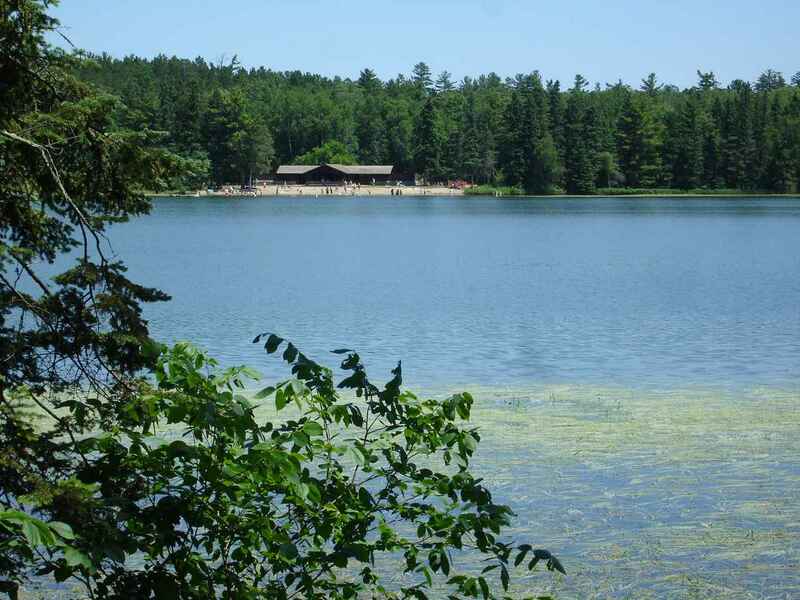 Like other Corps campgrounds, this one is located on a reservoir-Berlin Lake. This is a large Corps park with 348 sites. There is no water on the sites, but some have electric hookups. 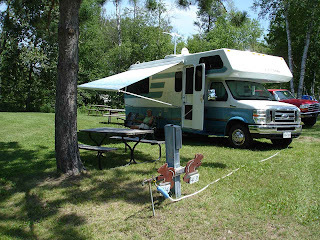 There are many water spigots throughout the campground with some threaded for easy fillup. The sites are huge! Lady Blue almost seems lost on our site. 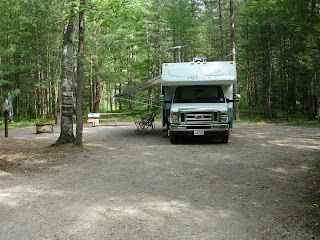 Ours is a dry camping site. No electric or water, or sewer hookups, but note the large, wide, and very level site. A large, strong table and a fireplace are included. 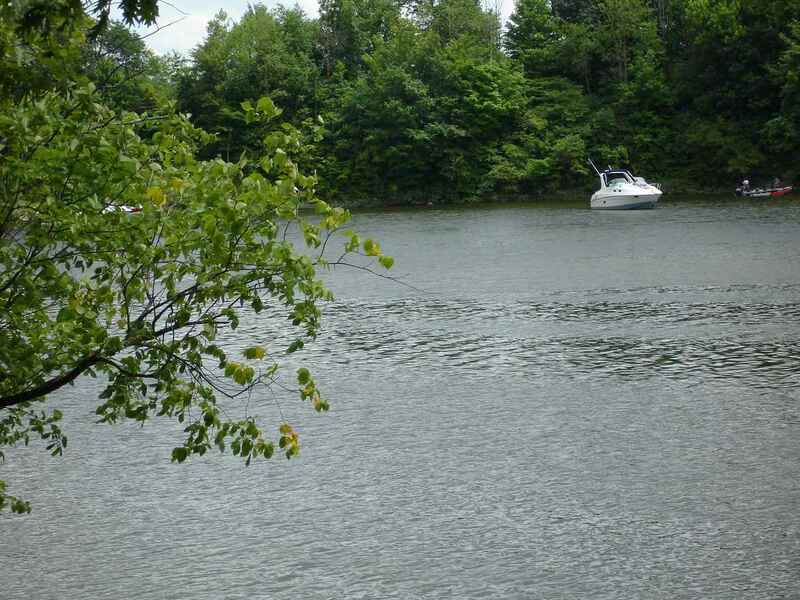 This waterside site is also a non-reservable site. That means that if it is open, you can take this site--there will not be any online reservations requesting or holding this beautiful site for anyone else. The view from our site. All this for only $9 per night for us old seniors. 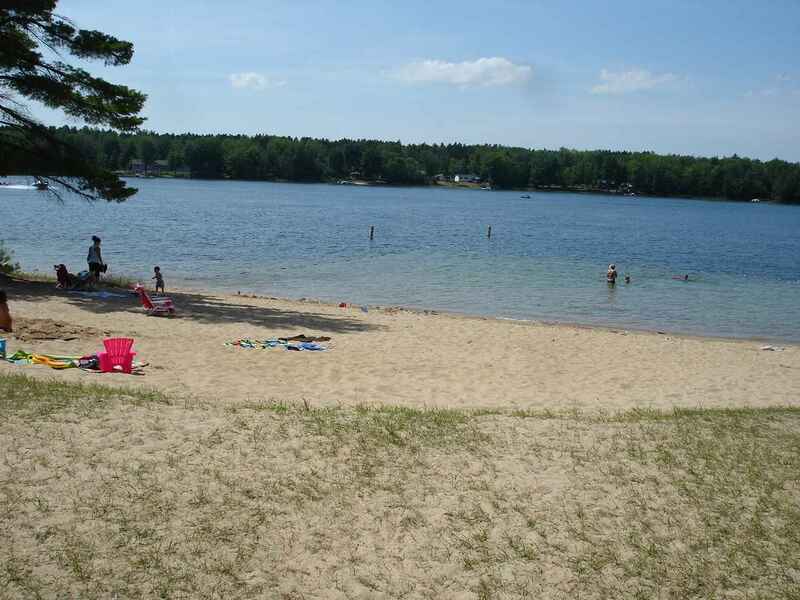 Berlin Lake is huge. Many fishermen in all sizes of boats. 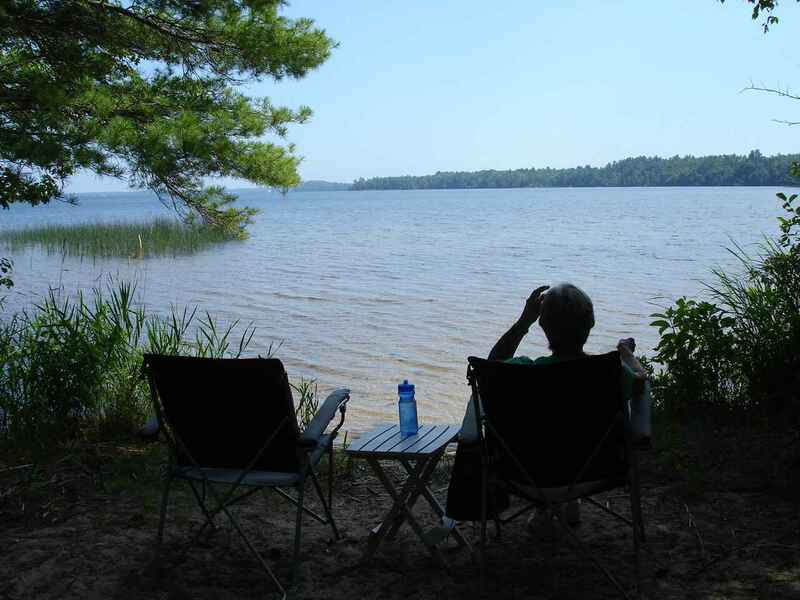 The sites, like ours, can also be used to fish along the shore or swim. Once again, we chose the Twin King Lazy Daze floor plan for the rear lounge windows. 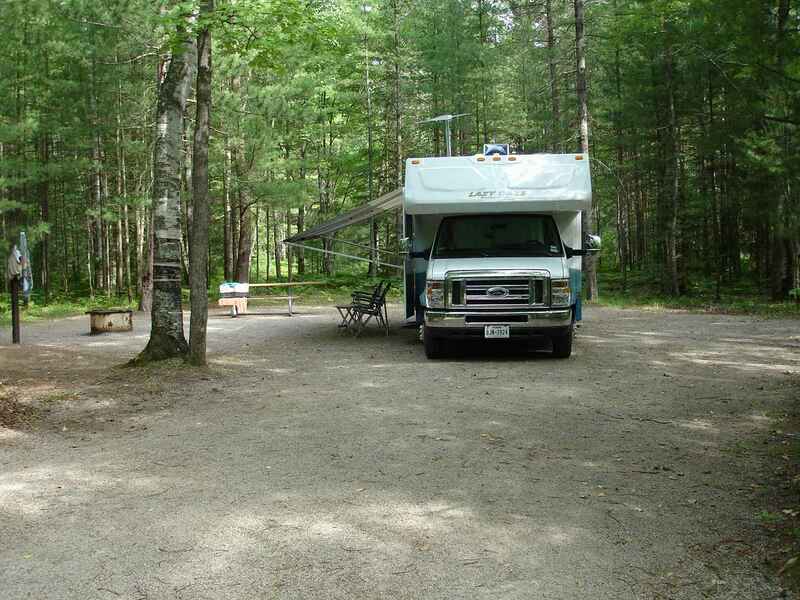 Perfect in campsites like this one. This is our view from our dining/lounge with no obstructions. Great!!! We will end this issue with two pictures that have been on our phone for a while. 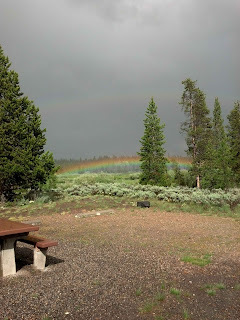 This one was from our campground in West Yellowstone, Montana. There had been a few showers while we were out walking and suddenly there was this bright rainbow. But notice how low it was. We had never seen a rainbow so low to the ground. If you look closely, you will also see a lighter rainbow a bit higher in the sky. 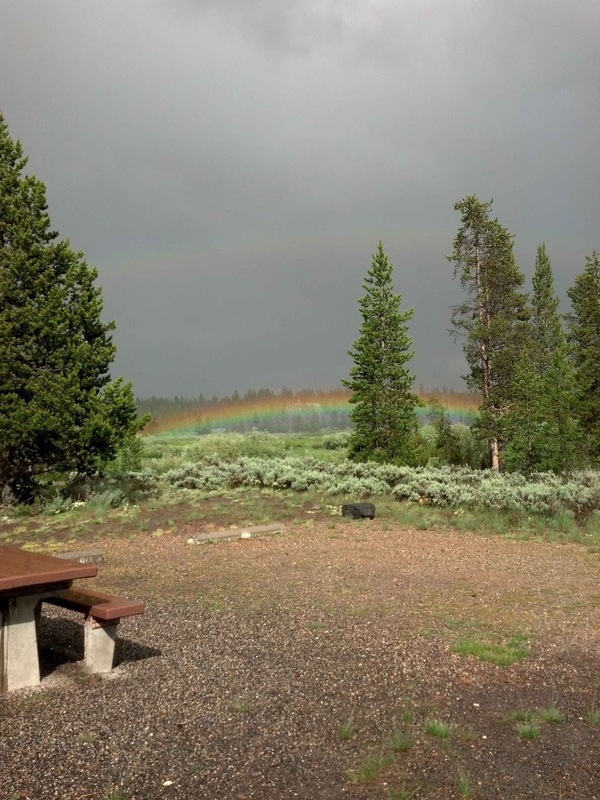 This rainbow was seen on our way down the long, long metal staircase in the Canyon Village section of Yellowstone. We were climbing down to see the Lower Falls that are to the left of the picture out of sight. At certain times of the day there is often a rainbow . Makes the long, steep stairway on Uncle Tom's Trail well worth the effort. We have really enjoyed the National Forest campgrounds of the Upper Peninsula of Michigan. 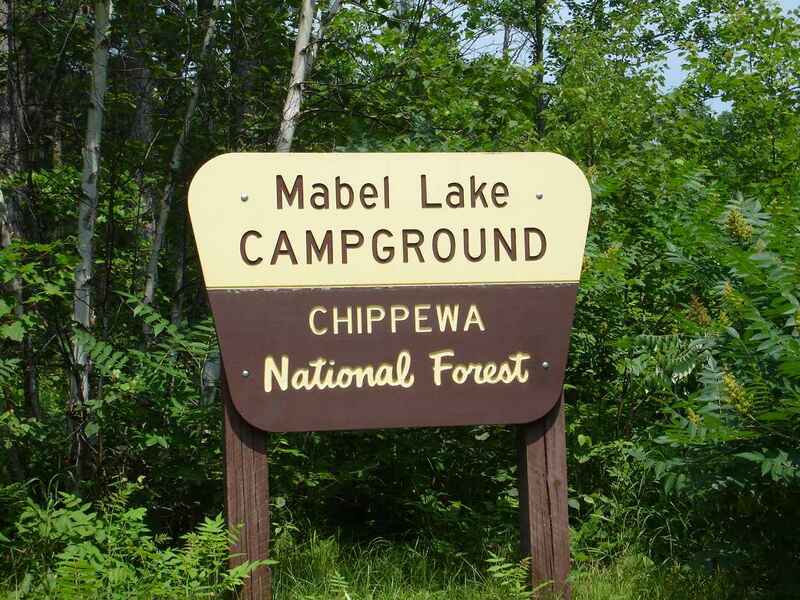 It would have been easy to spend more time in the Upper Peninsula. 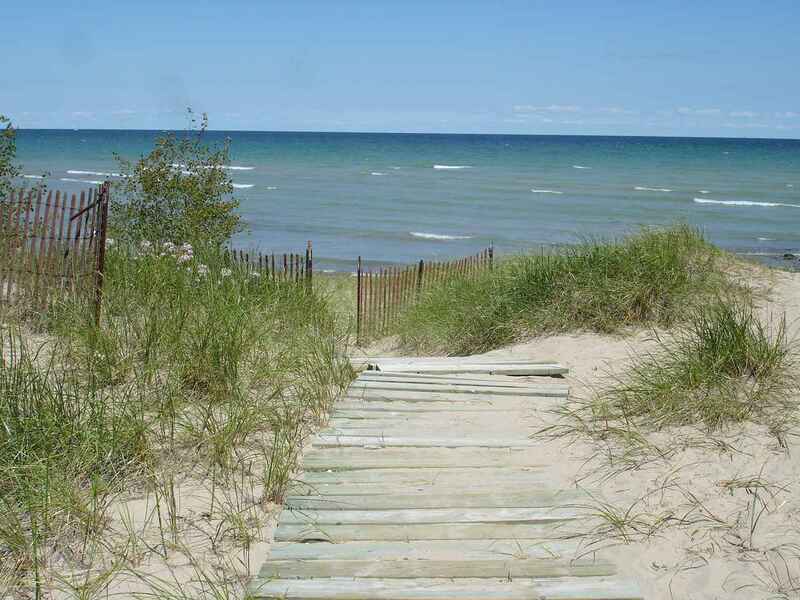 Friendly small towns , easy access to Lake Michigan, and great , inexpensive campgrounds. 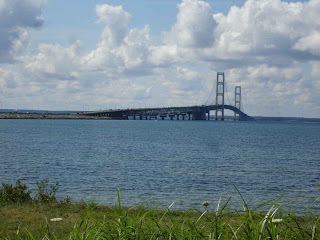 But, it was time to head over the Mackinac Bridge. 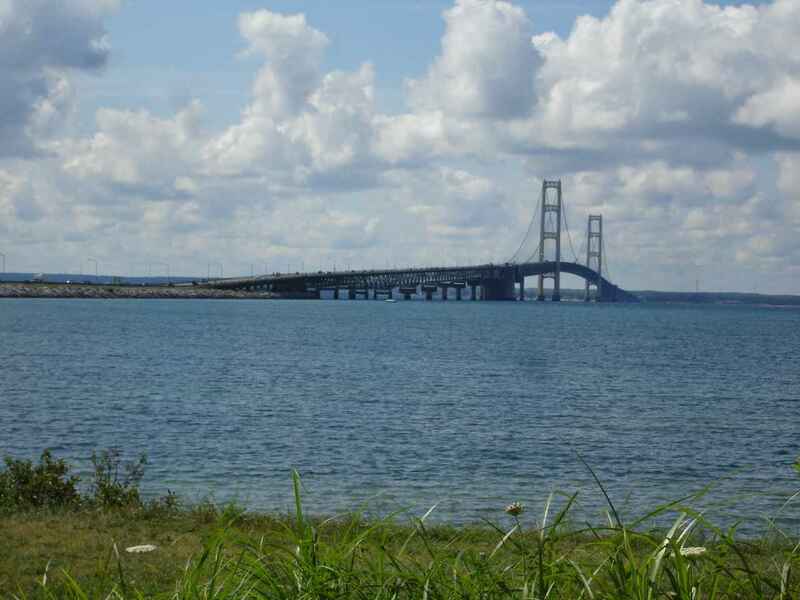 The longest suspension bridge in the western hemisphere, it is very impressive. Built in our lifetime, it was a boon to economic growth in Northern Michigan. 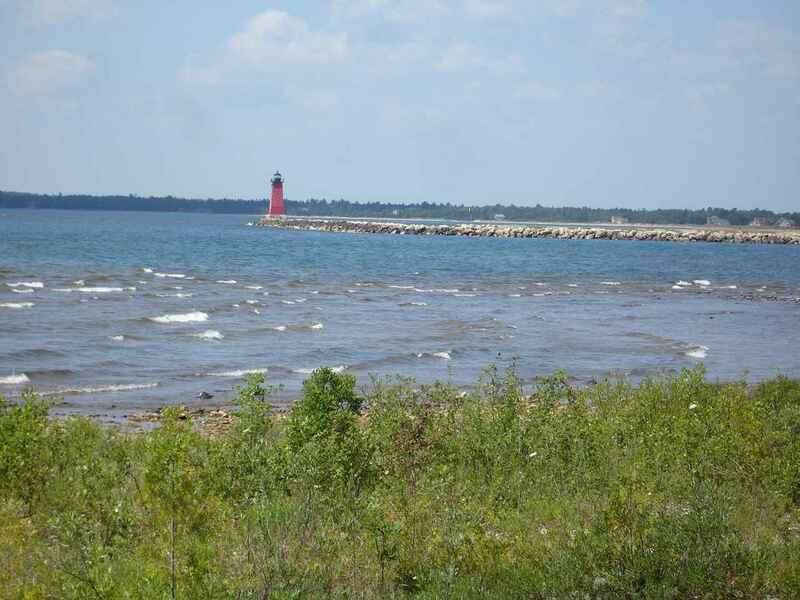 After crossing the bridge, we head south on the eastern side of the Lower Peninsula on Route 23. 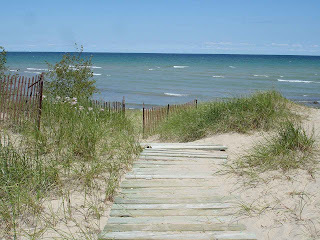 Passing many beautiful homes right on Lake Huron and lots of open spaces. It is not at all crowded. 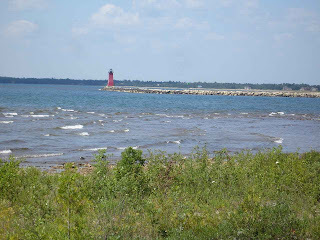 Stopped in Cheboygan, which was a quiet town with a pleasant Main St. right on Lake Huron. 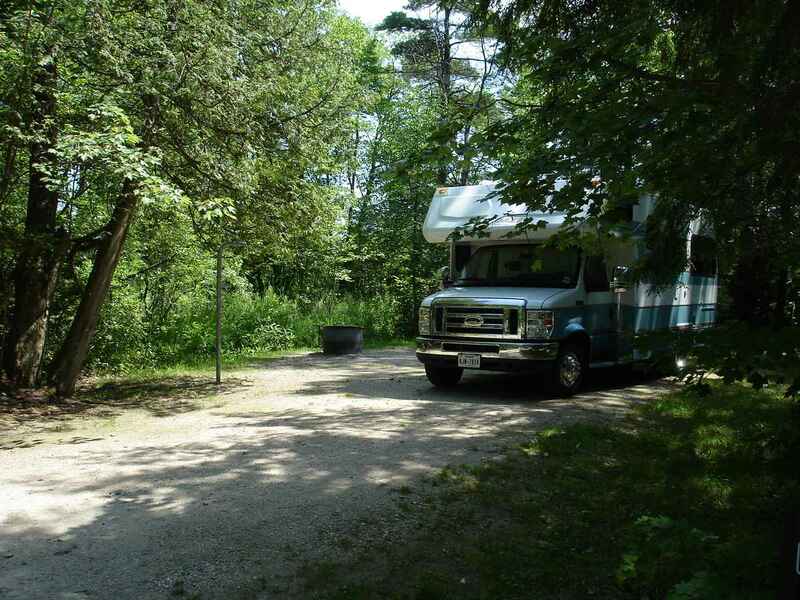 We have wanted to try state parks across the U.S., so we decided to try Michigan state parks in the Lower Peninsula. Our first park is P.H. Hoeft. These parks in this section of Michigan are right on Lake Huron. They are neat, well run, and very popular. They are also a bit more expensive than we expected. 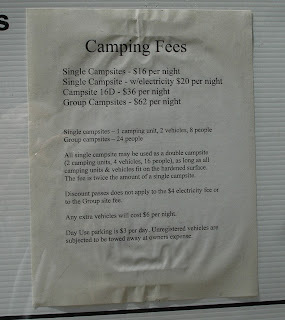 There is a charge for the camping--usually in the $20 plus range--but there is also a day use charge added on. Not cheap. We were lucky to find a spot. 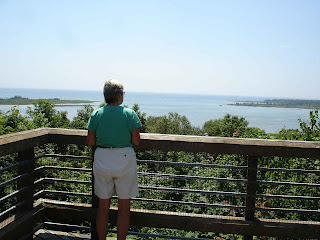 The views remind us very much of Cape Cod seashore. So surprised to not have salt water!! Right out of the park is a paved bicycle trail that will take you to 40 Mile Point Lighthouse. 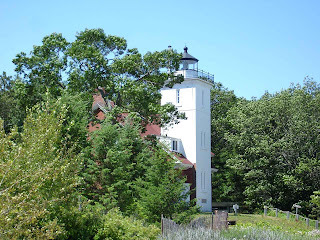 The coast of Michigan is lined with many, many lighthouses. This one looks very much like a regular house with an afterthought added on as a lighthouse. Quite popular, with docents in the light house, furnishings from the 1800's( how come we remembered having so many of these items in our house growing up? ), gifts shop, and more. 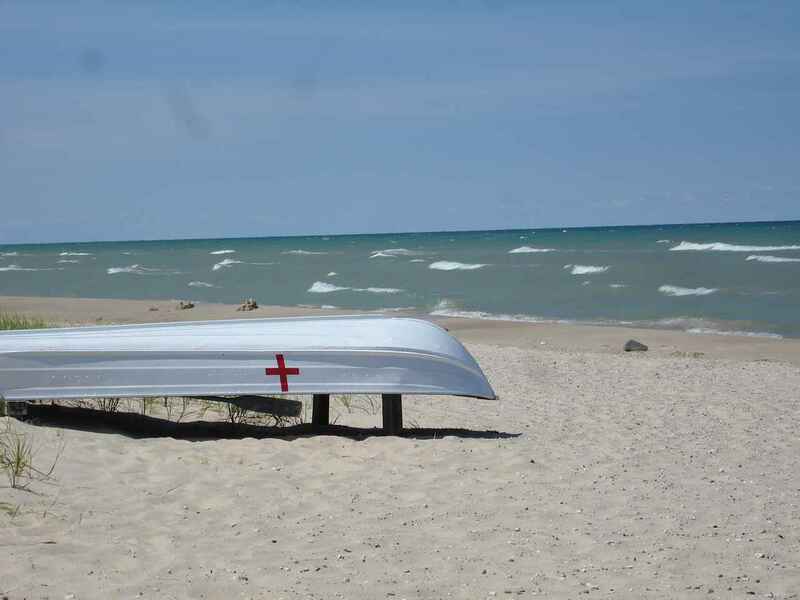 Notice that the Great Lakes can have surf-- of sorts. There are also many mentions of shipwrecks---the reason for so many lighthouses. That also reminds us of similarities to Cape Cod. Our procedure in the state parks is the same as what we followed in the national forests. We mention that we are self-contained with a view out our back windows. They will mention that the beachfront sites are close together and quite busy. And we will mention that we are quite happy to be more secluded and away from the beach. Love the site! Unlike some other states , we notice that Michigan has electric service on all sites. We had to remember how to plug in! 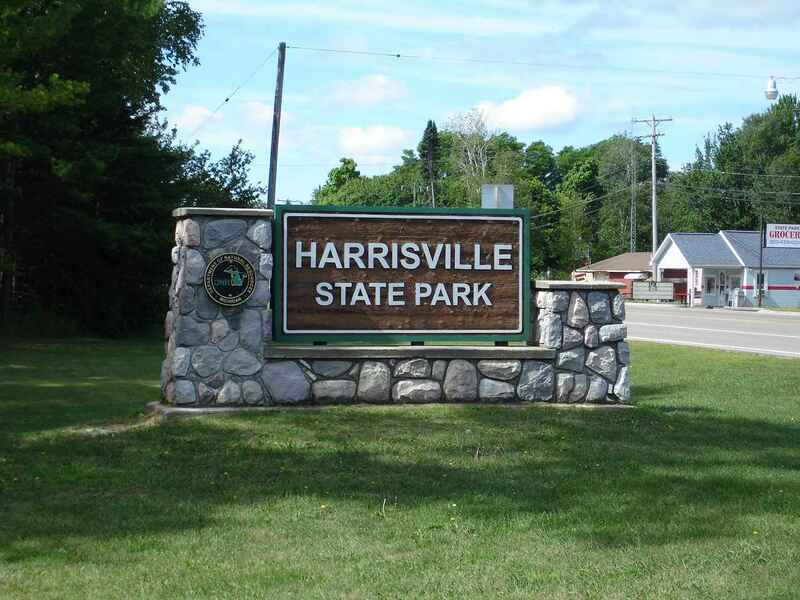 We are now in Harrisville State Park. 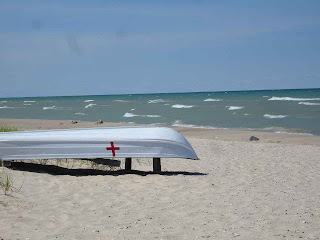 Still on Route 23 and still on the shores of Lake Huron. 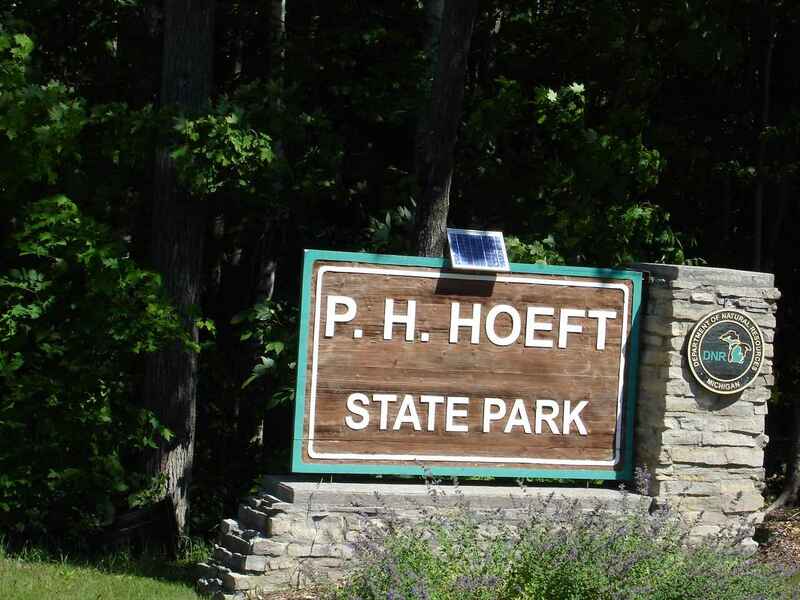 This is one of Michigan's oldest state parks, established in 1921. 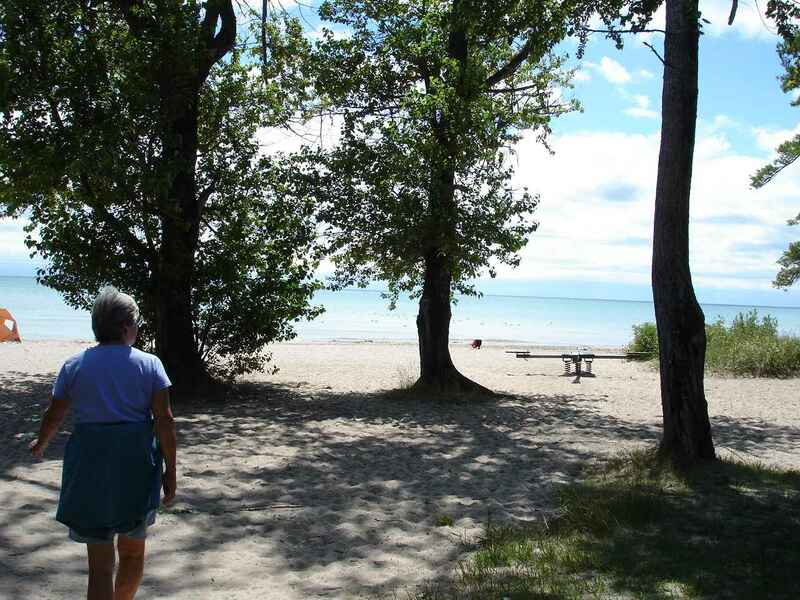 Unlike Hoeft, the beachfront sites here are not just close to the beach, they are on the beach. No dunes between. You can understand why families are loving this park. On the off season, we would be quite happy to choose a beach site , if it were available. But , at this time, for us, we love having our nice , quiet, private site. 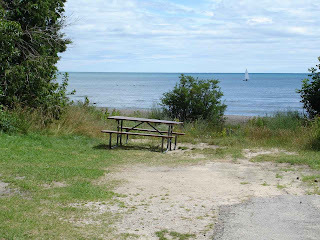 That still allows us to walk the park trails, walk the beach, bring our chairs to beach--not at all crowded in late July. 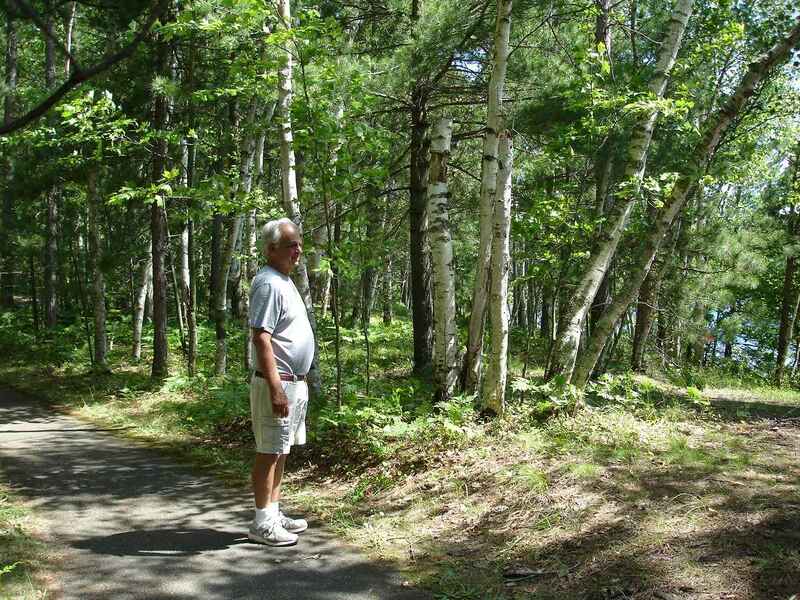 Part of what we look for in state parks is a good system of roads and trails for walking. 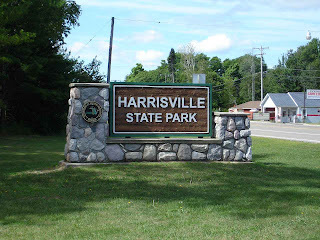 Harrisville does not disappoint. There is even a bike,walking trail into town which would access many stores and restaurants. It would be about 2.4 miles. 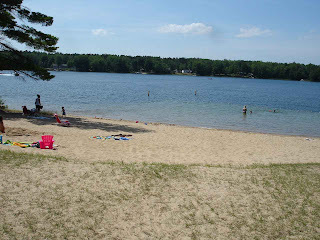 Approaches to the beach remind us of Sebago Lake State Park in Maine. Some differences--you cannot see the opposite shore, the beach is very fine sand and goes on for a great distance. Plenty of room for lots of beachgoers with no crowding. Also, these two parks seem to have a long run of shallow water before the water gets too deep. Great for parents with small children. Once again, this is a warm day in later July. Not very many people crowding the beach. Good place to relax and enjoy. Above is our spot at Wanoka Lake National Forest in the Chequamegon National Forest, east of Iron River Wisconsin . Coming out of Minnesota , it was a very short trip through northern Wisconsin and into the Upper Peninsula of Michigan. 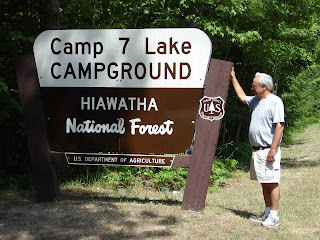 For those who like to follow on the map, we left Itasca State Park in Minnesota on Route 200, east to pick up Route 2 , and then through Duluth, Mn. into Wisconsin on Route 2. 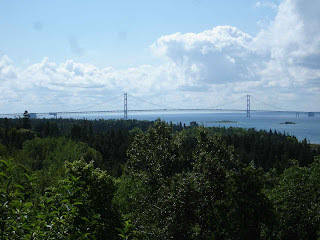 We then followed Route 2 all the way to the Mackinac Bridge in the Upper Peninsula of Michigan. This is a very rural US route with little traffic and very pleasant scenery. As a note, we have been noticing how quiet these main roads have been. Traveling through Wisconsin, we had times when we could see for miles, but we were the only vehicle in sight. Sometimes it is hard for our Massachusetts minds to wrap around Wyoming, for instance, which is the 9th largest state. But the largest city, Cheyenne, has a population of only 59,446! The entire state of 97,100 square miles has a population of only 563,626. That is a ranking of 50th out of 50 states. VERY peaceful. Every so often, we need to stop to empty the tanks and do a laundry. 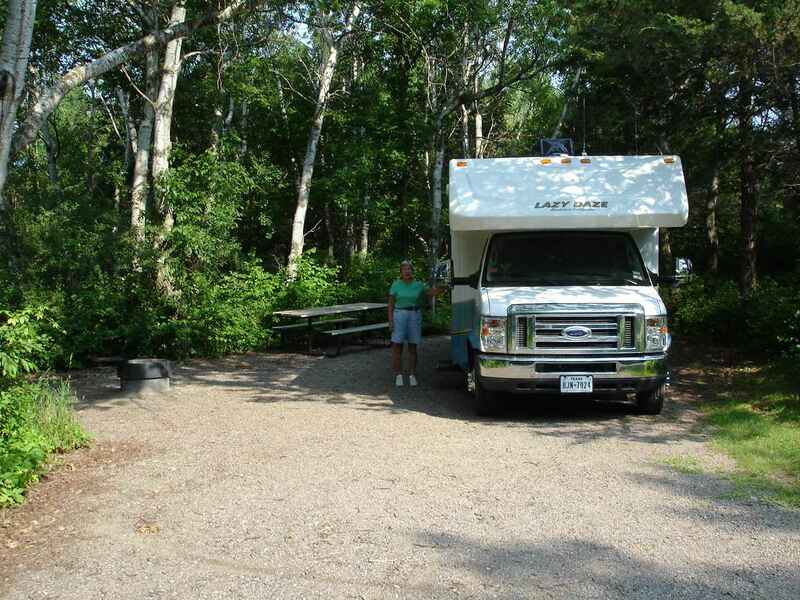 We could find, and have on occasion found, a local laundry in a passing town or we can stop at a private campground. 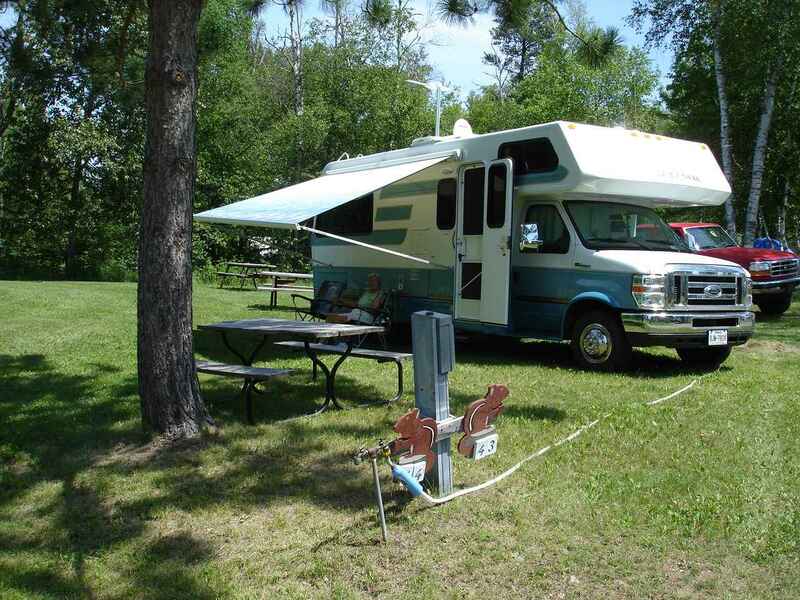 This was Summer Breeze in Iron Mountain, Michigan. Very clean laundry, very nice people. 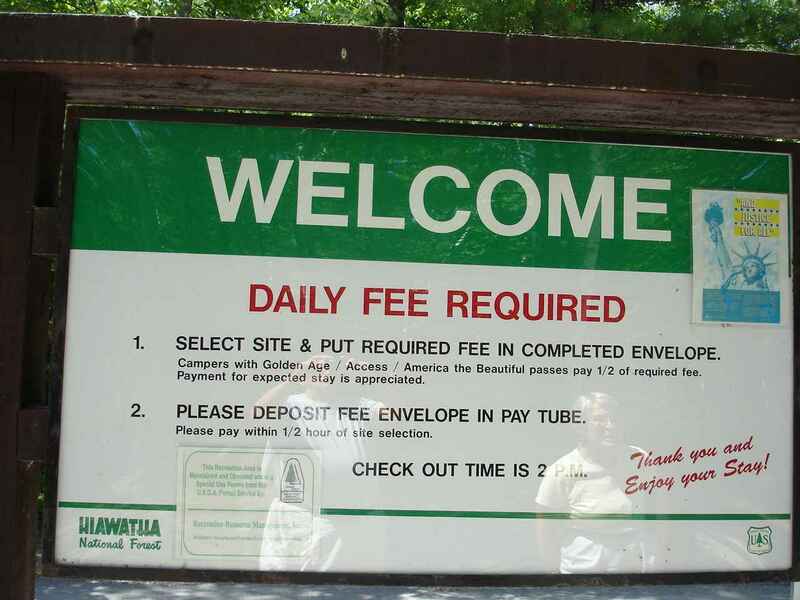 And the price, with an Escapee discount was less than a state park. We even connected to electricity--it worked! A great plus of stopping in Iron Mountain was discovering Pasties. That's pronounced Pass-tees!! The area was settled by a number of immigrants from different countries--Finland, Sweden, Germany, and Great Britain. From Cornwall , England came the miners to work the iron mines. They brought with them this delicious little meat filled pastry. Filled with beef, pork, potatoes, onion, seasonings, and rutabaga(or not). They were handy meals for the miners to take with them. A number of shops feature them. We found ours in Iron Mountain at Pasty Oven on Route 2. We don't want to forget finding a great cheese shop on a back road of Ashland , Wisconsin. The Benoit Cheese Shop had a wonderful variety of 140 Wisconsin cheeses. We had to purchase a few pounds of a 9 year old cheddar and a raspberry sartori. 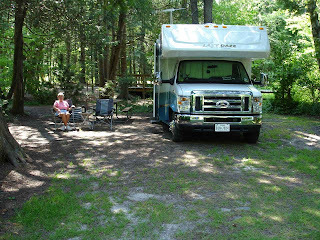 We have used the Good Sam RV Travel Guide(Trailer Life and Woodall's) directory, the All Stays app for smartphone, our Escapees book, Passport America, State Parks book,Corps of Engineer book, and the Dow National forest list to find different campgrounds. We find the Dow list to be very accurate on the size of the sites and the directions. 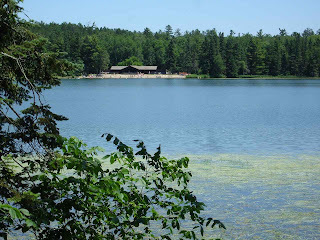 For instance, Camp 7 Lake in the Hiawatha National Forest near Manistique, Michigan was a great stop. Note how large our site is. We felt like we should invite others to join us!. Excellent separation from adjoining sites. 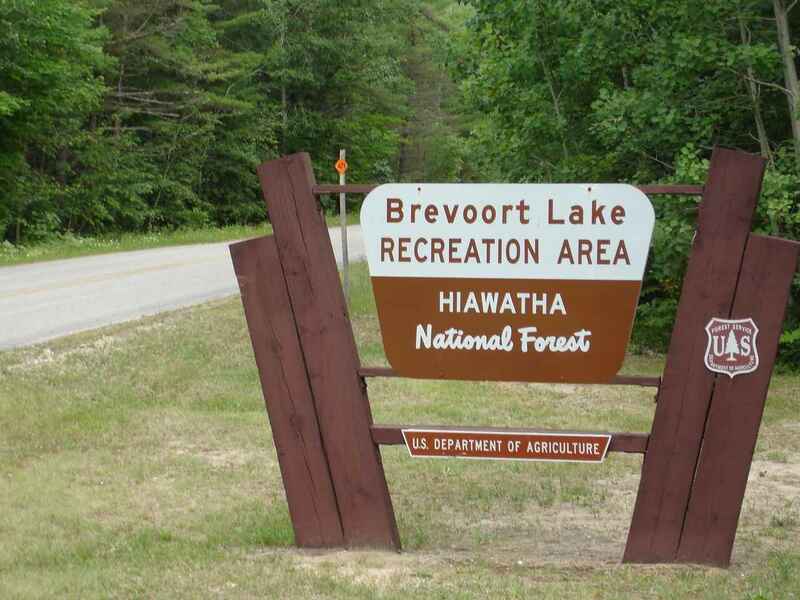 Typical of a National Forest campground is a bulletin board as you enter. The little green box has a fee envelope for you to fill out. To Jan's right is a cylindrical pipe to place the envelope and fee. Don't expect to have an office. 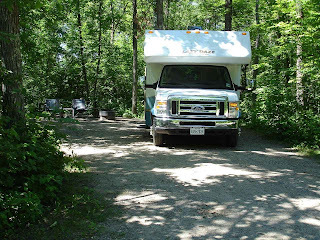 Quite often there is not even a campground host. So far, we have found them to be quiet, clean , and great places to stay. As you can see, there are sometimes electric sites available. 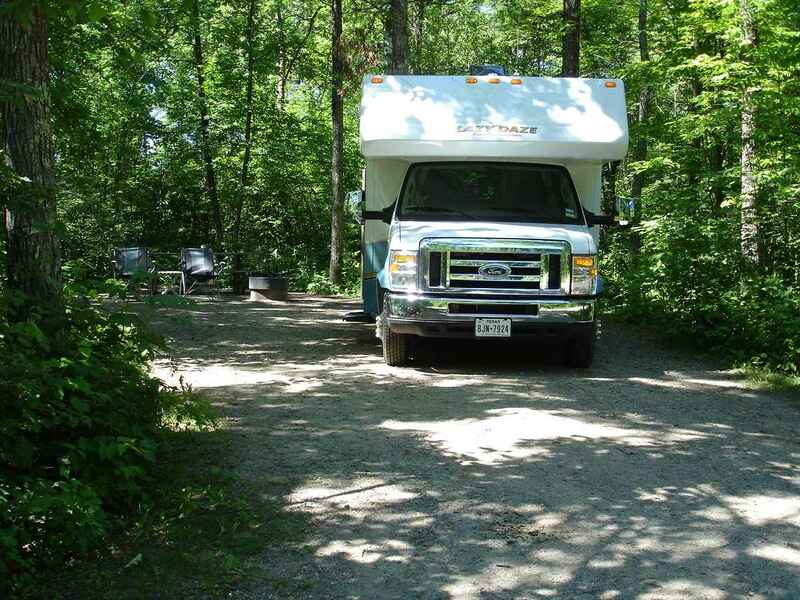 Since we do not like to make reservations, we never plan on having an electric site. Most often , they are reserved well ahead anyway. Also, we usually prefer to be away from these sites where it it is quieter----and often the sites are more separated. 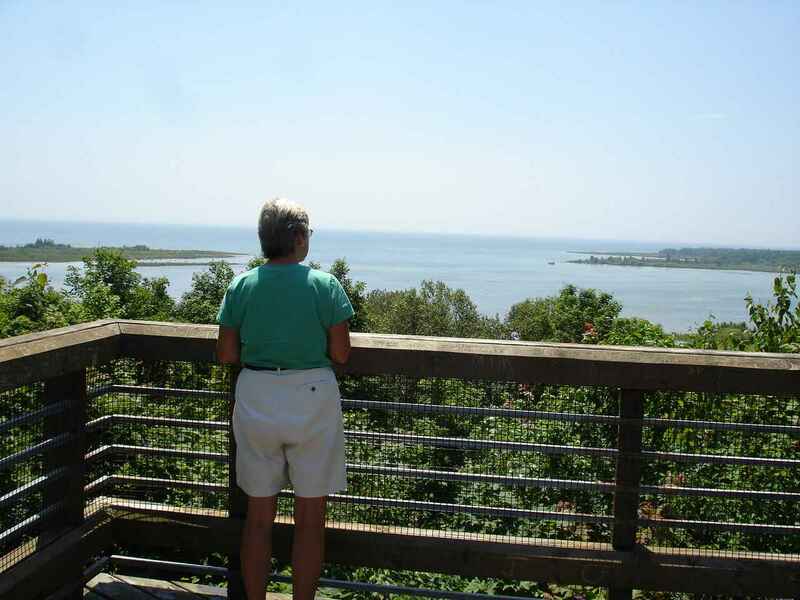 In this case our site was $16 , and as you can see from the picture below, only $8 per night with our National Park America the Beautiful Senior Pass. Beautiful fishing dock. Most of the fishermen, however, were using their boats for fishing. 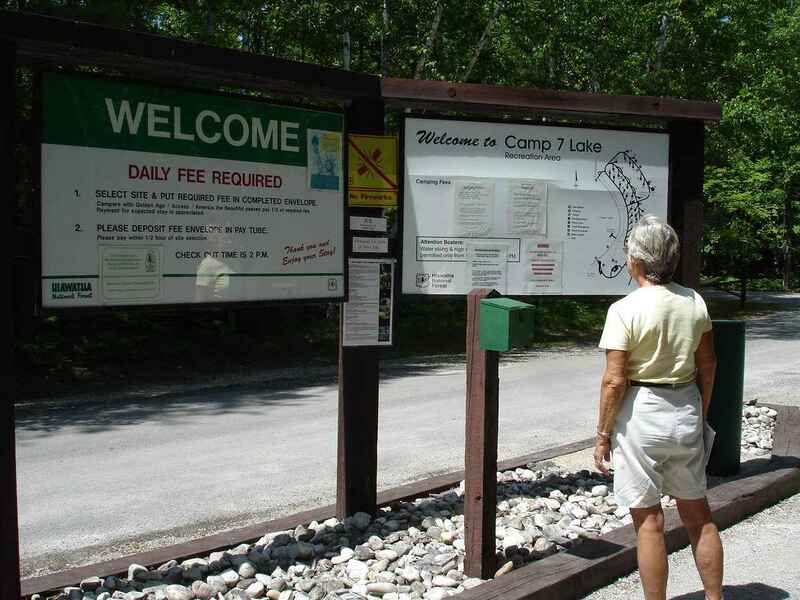 We enjoy a campground that offers plenty of walking opportunities. This campground had paved trails by the lake and a path that went around the lake. At 90 plus degrees and quite humid, we settled for walking in the park. Many of the sites could just walk to the water for swimming. The shore was well lined with good sand. We even took advantage of the beach area for a few days. Jan and I found a nice post office in the quiet town of Cooks, MI. Not far from the railroad tracks, the postmistress was very friendly and helpful. She even recommended a grocery store on our way east. Across from Jack's in Manastique is a great view of Lake Michigan. Route 2 at this point offers a number of spots where people can pull over and use the beach or just sit and enjoy the lake--very much looking like the ocean. Great views and a little cooler on a hot, humid day. 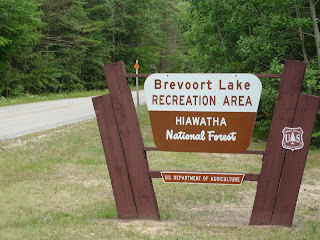 Our next stop is at Brevoort Lake Campground in the Hiawatha National Forest. 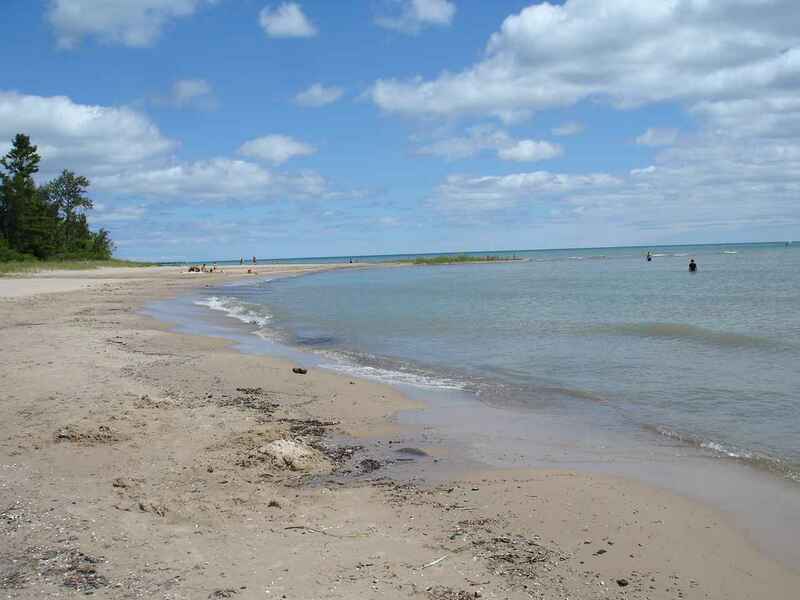 It is a good sized lake that is only one mile north of Lake Michigan. 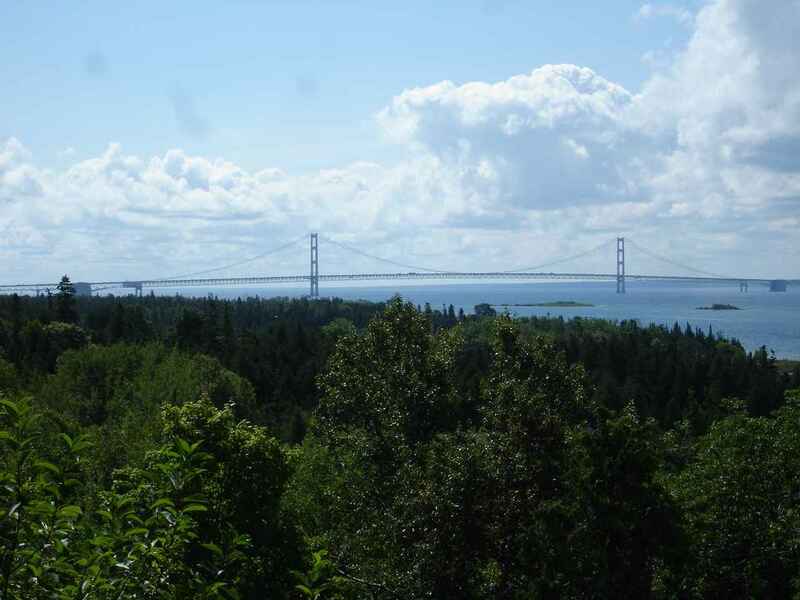 Very close to St. Ignace which is the northern entrance to the Mackinac Bridge. Good place to wait out the thunder storms that will clear out the hot and humid air. Nice campsite for coffee---when the sun shines. You never know what might suddenly appear on the side of the road. 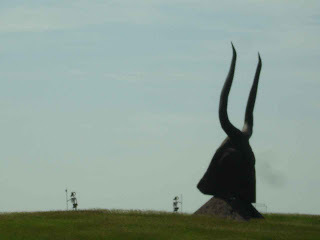 This was a sculpture garden(large) beside Route I-90 as we left Vermillion State Recreation Area. It is facing across the highway to westbound traffic. It certainly attracts attention. Speaking of Route I-90( Yes, that is the same Mass. Pike that winds up in downtown Boston), it was an interesting drive from western South Dakota to Minnesota. Coming east out of the Black Hills, the land reminds you a little of Utah, but not totally desert. It is not long before the fields start turning quite green with fields of beef cattle as far as you can see. Some herds by the highway are hundreds and into the thousands with plenty of good grazing land. Then the grass becomes much higher and the fields become mostly corn fields. There are many shiny silos at each farm. 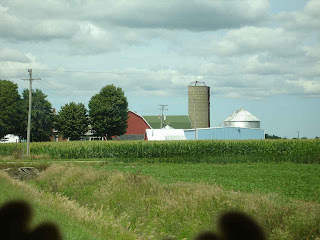 Jan counted more than 20 silos at one farm. Driving through some towns we see the cooperative grain elevators. One town had a large tank labelled Ethanol. The gas stations have a separate pump for extra percentage of ethanol( only for flex fuel cars). Also noted on I-90. Very little traffic. And after a number of miles, we both realized that we were not seeing any trailer truck traffic. No Trailer Trucks!! Not sure why. Must just not be a preferred route. 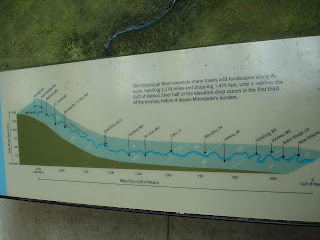 Entering Minnesota and heading north towards Itasca State Park we note that the farms are becoming smaller and the hills rolling and closer together. By the time we reach the park, the landscape looks much like northern Maine. Always happy to stay at state parks. 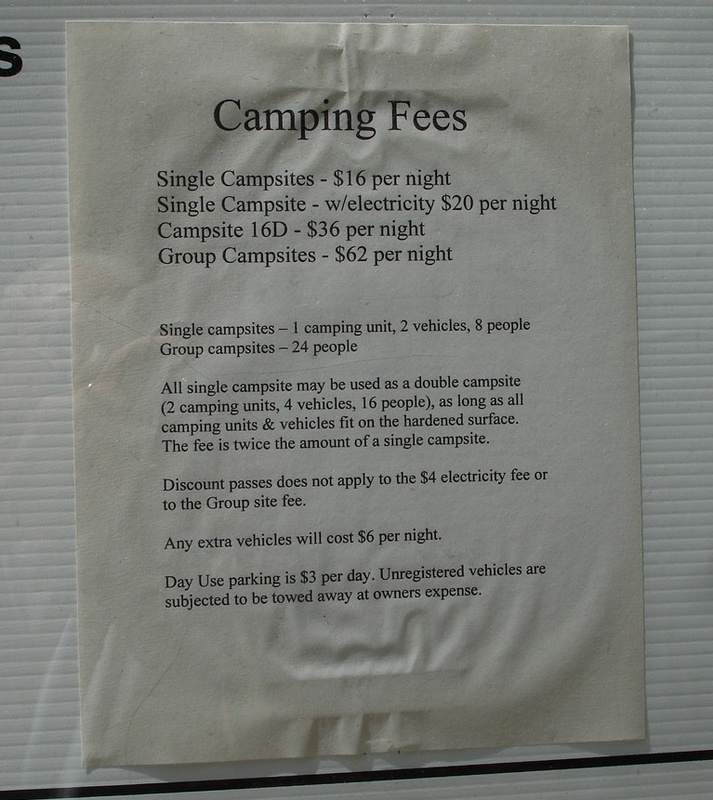 We do note, however, that Minnesota and others seem to charge a camping fee in the $20 range and then add on a day use fee of $3 to $6 dollars. Out of staters do not get discounts. 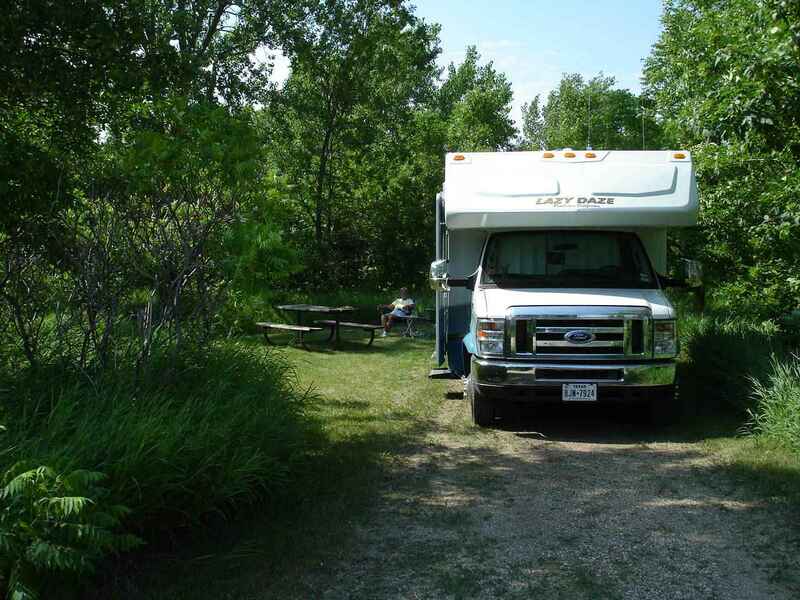 We usually opt for dry camping sites. They are quieter and most often larger than the electric sites. Above and to the right are pictures from Camden State Park in Minnesota. 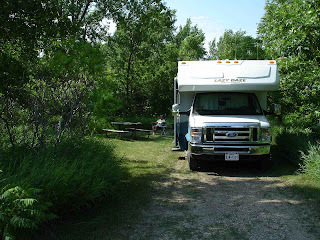 Some nice trails were found and good sized campsites. Another example from the Civilian Conservation Corps. President Roosevelt in the 1930's created the Corps to put men to work who had lost jobs to the Depression. 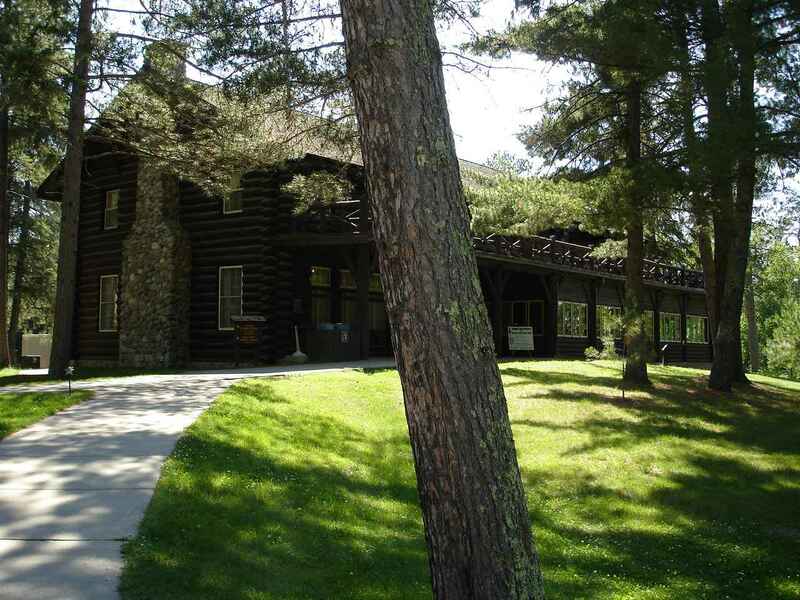 We have seen many strong, sturdy state park buildings and walls all across the U.S. still being used today. Not only long lasting , but very pleasing to the eye and fitting to the outdoor feel of the parks. Another nice site, this time in Sibley State Park. Without hookups, we are in a very quiet section. The electric sites here were very close together. Hard to get road pictures while moving. On this road there was no break down lane or turnout, so moving pictures it was. 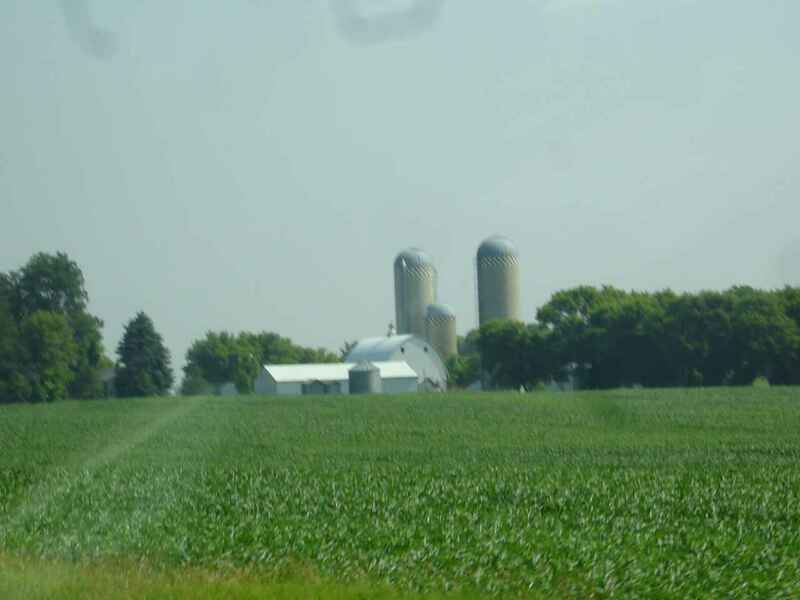 This was a typical farm from the west central part of Minnesota. Towns were quite far apart. So glad we headed for Itasca State Park! 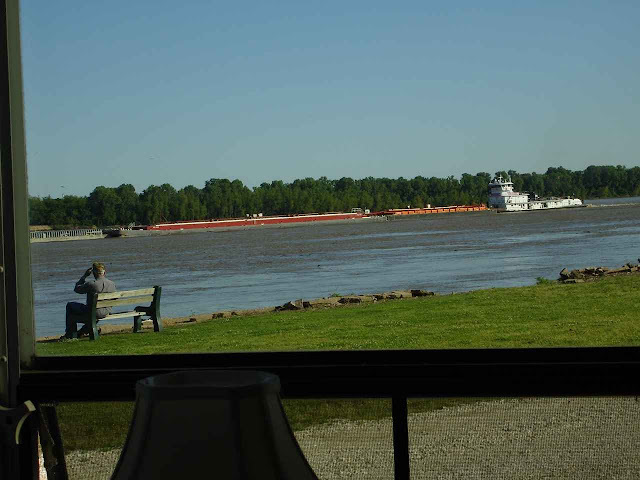 Having seen the Mississippi River in New Orleans and camped beside it in West Memphis, Arkansas; we decided it was a good idea to see where the river gets its start. Once again, we opt for a dry camping site. Very woodsy with lots of privacy. 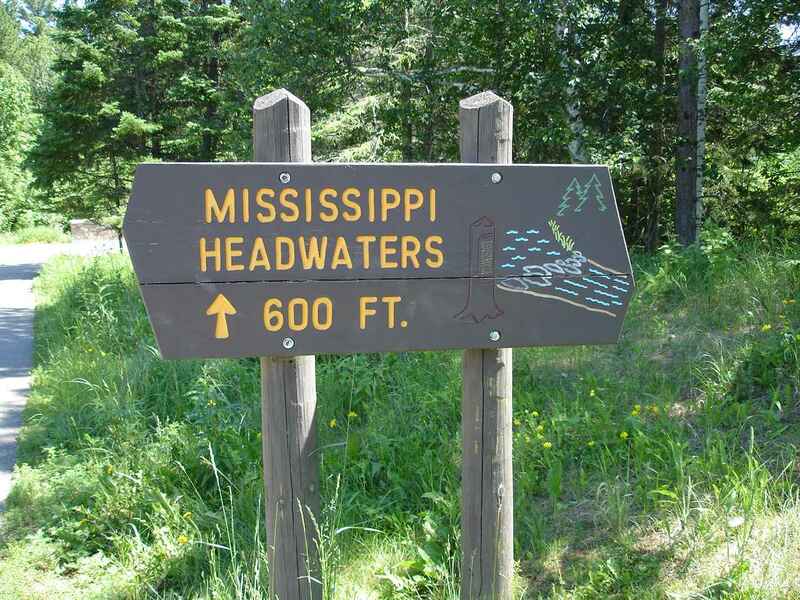 And sure enough, there is a trail to take us to the Mississippi Headwaters. 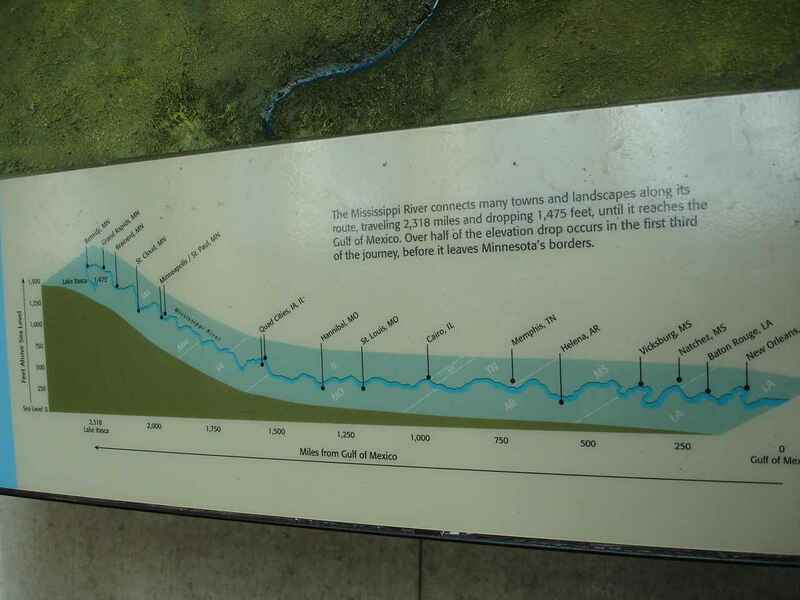 Seems it took a while in the 1800's to determine where the river actually began. 2,552 miles of river. 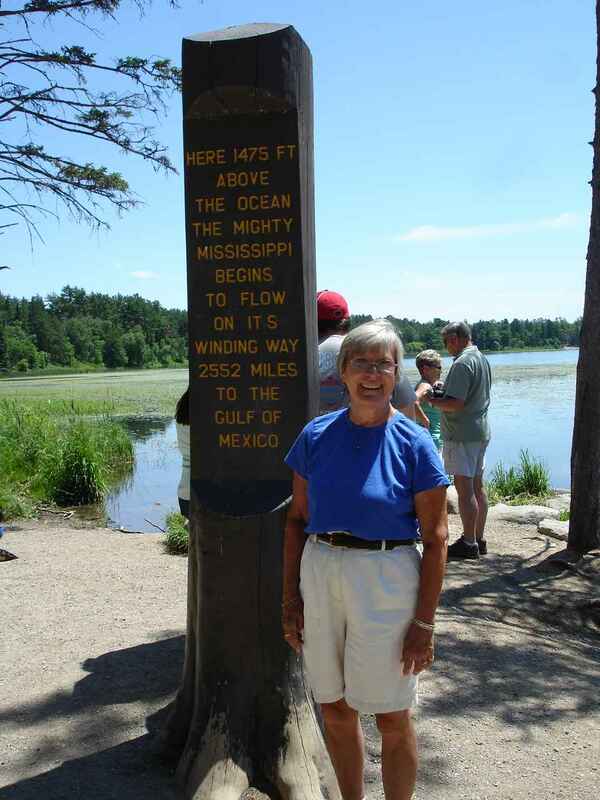 It's hard to imagine that this 3rd longest river in the world could find its way from northern Minnesota to the Gulf of Mexico. It manages to drop an average of 3 feet every 60 miles. Actually, if you enlarge the picture to the left, you will see that it drops much of its elevation before it leaves Minnesota. 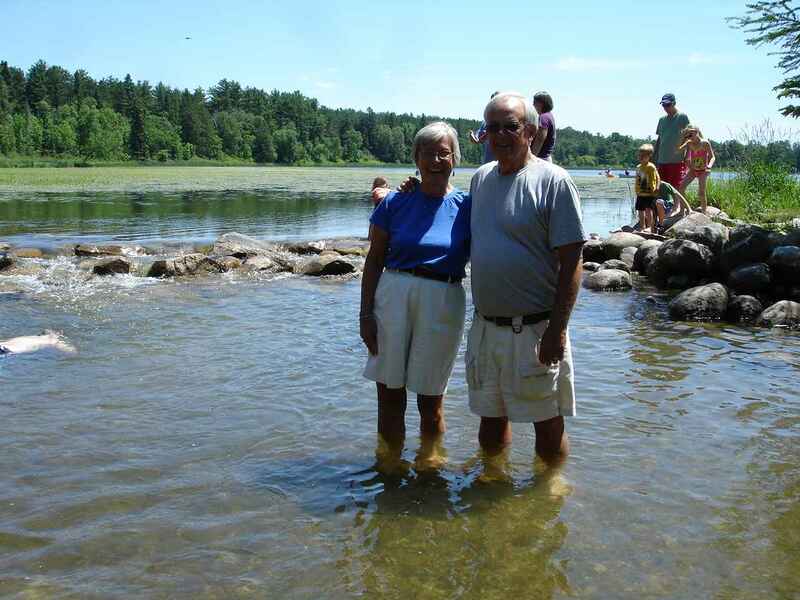 Jan and Bruce are wading across the great Mississippi River. On a hot humid day, it was actually quite refreshng. Some of you might remember this picture from the Spring of 2010. 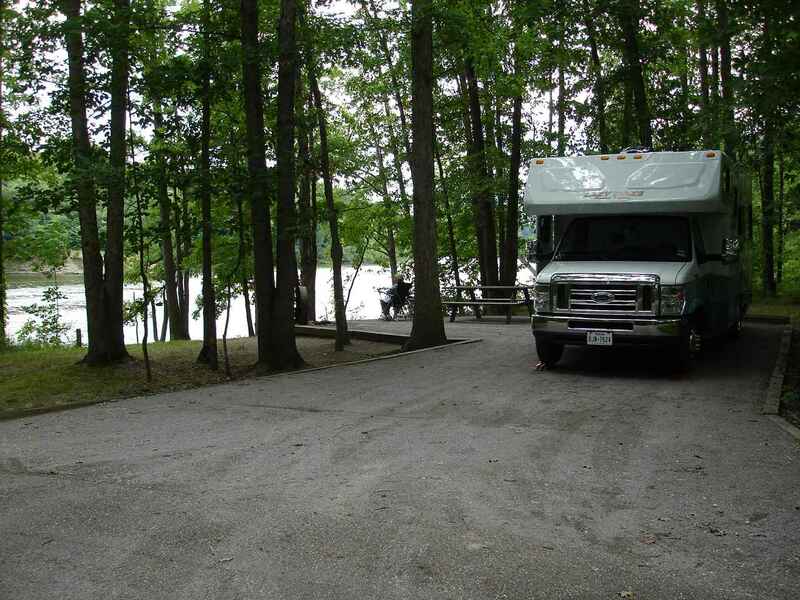 We were camping in one of our favorite campgrounds, Tom Sawyer, in West Memphis , Arkansas. 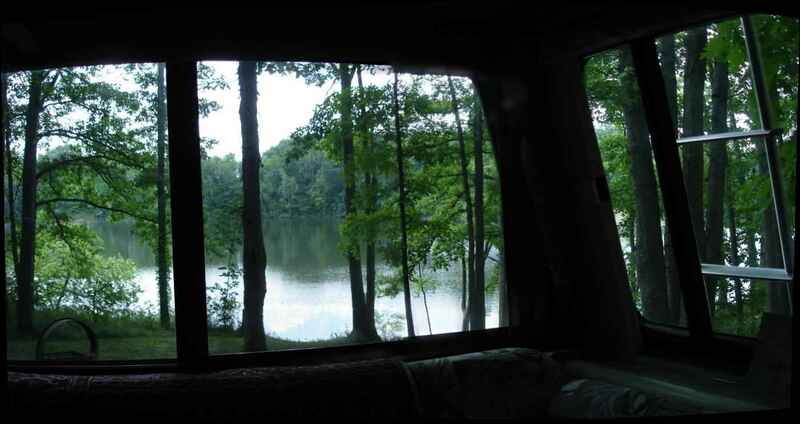 The picture is out the back window of our 5th wheel trailer. We remember this stay, because we had to leave the next day . The water was rising and the river would flood. 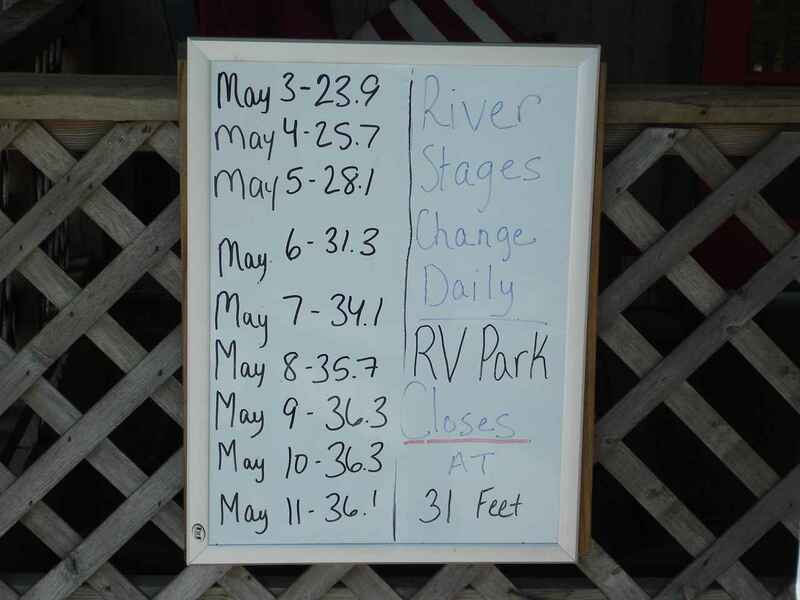 Within a week, our campsite would be under 10 feet of water. A common occurrence at the campground, but unusual for us. This was posted at the park office. 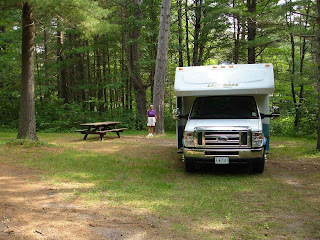 In case some of the campers were reluctant to leave, the 31 foot level was quite firm. The campground closes! Itasca had something for everyone. Beautiful , large swimming beach. Rental canoes and boats. And even bicycles. Also, lots of deer flies and mosquitoes. 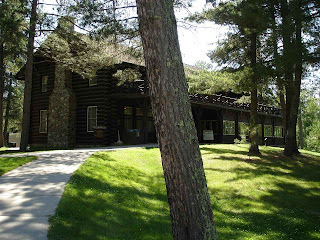 Itasca is the oldest state park in Minnesota. It was another good decision by forward thinking officials to save and preserve the natural spaces and woodlands for future generations. Without their preservation, the park would have fallen to the lumber interests in the 1800's, and then to private owners. 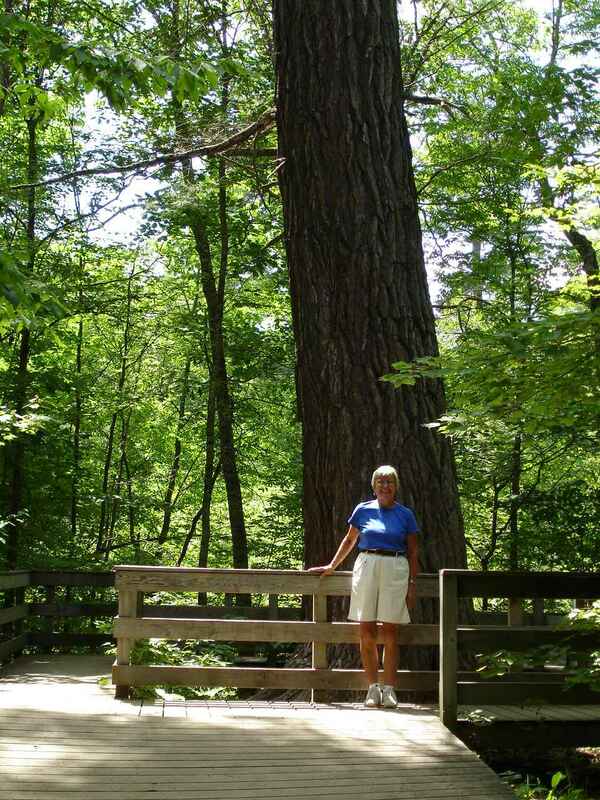 Jan is standing in front of the oldest white pine tree in Minnesota, about 300 years old. 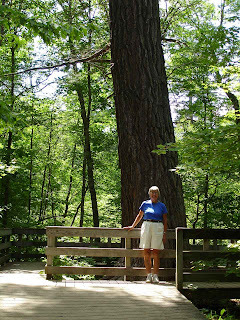 Sometimes, this area is referred to as the land of the tall pines. We always like seeing the lodges at the parks. 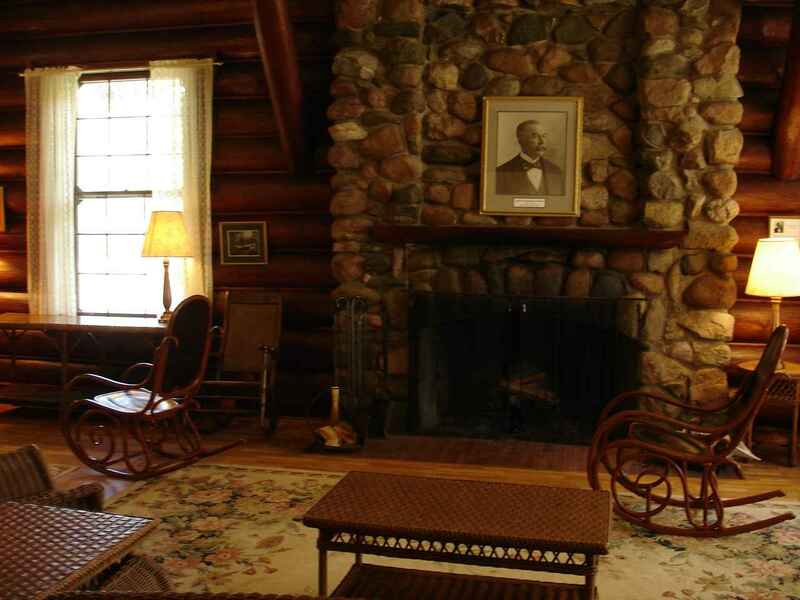 This living room space at Douglas Lodge is looking so comfortable. We did have a late lunch at Douglas Lodge. Two glasses of Minnesota red wine, some appetizers of fried Walleye and Sweet Potato fries, and a slice of Blueberry Pie A La Mode. Besides the Walleyes, Minnesota is also known for blueberries. 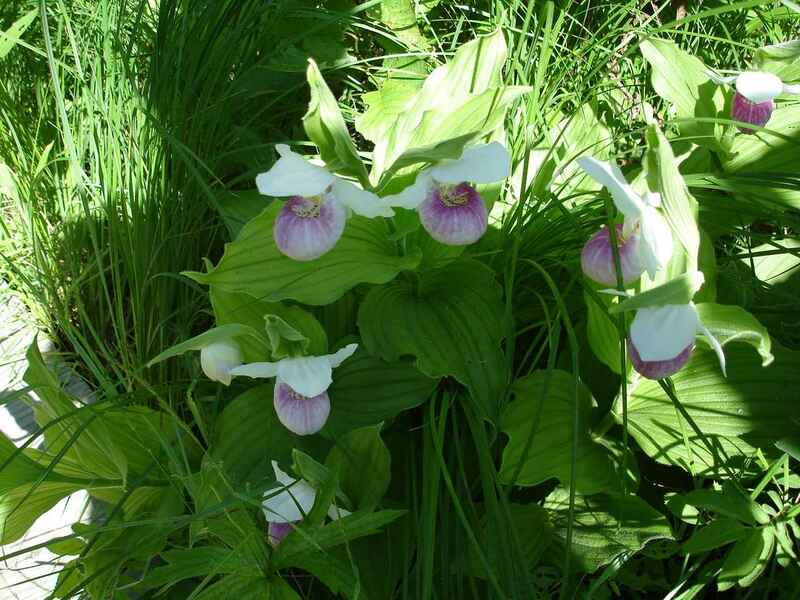 It is also know for its state flower, the Ladyslipper. Looks quite different from those we have in Massachusetts. Minnesota is also the land of 10,000 lakes. We believe it. 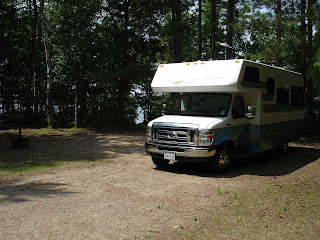 On the way to Lake Itasca, we saw lakes on both sides of the highway for miles and miles. There are so many campgrounds and resorts, we had a hard time imagining that they could all be full at any time. 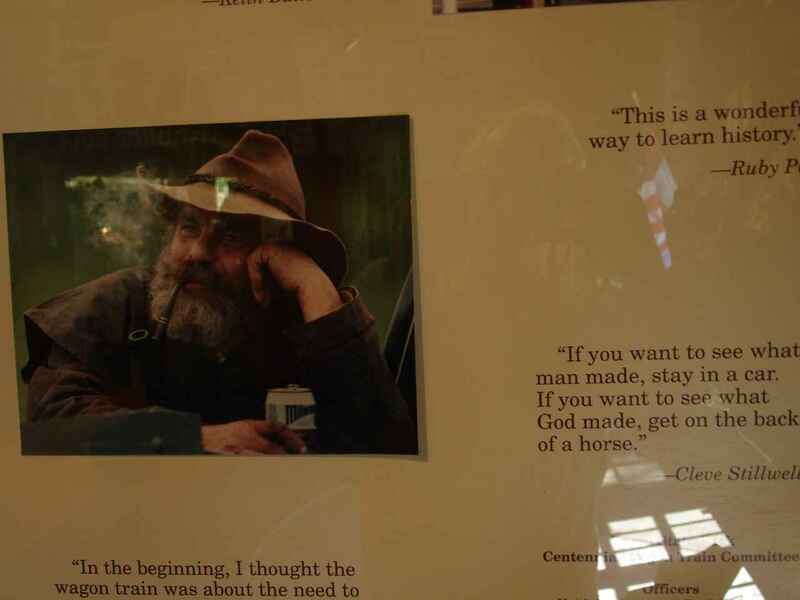 In Douglas Lodge was a poster commemorating the 1991 Centennial Wagon Train. 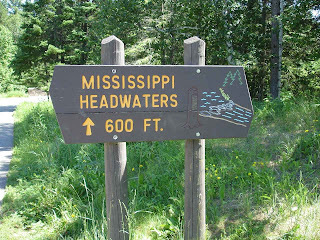 16 days, 279 miles,40 wagons, and 200 saddle horses; the wagon train traveled from the state capitol to the Mississippi headwaters in Itasca State Park. We liked the saying next to the picture of one of the participants. You might not need a horse, though. 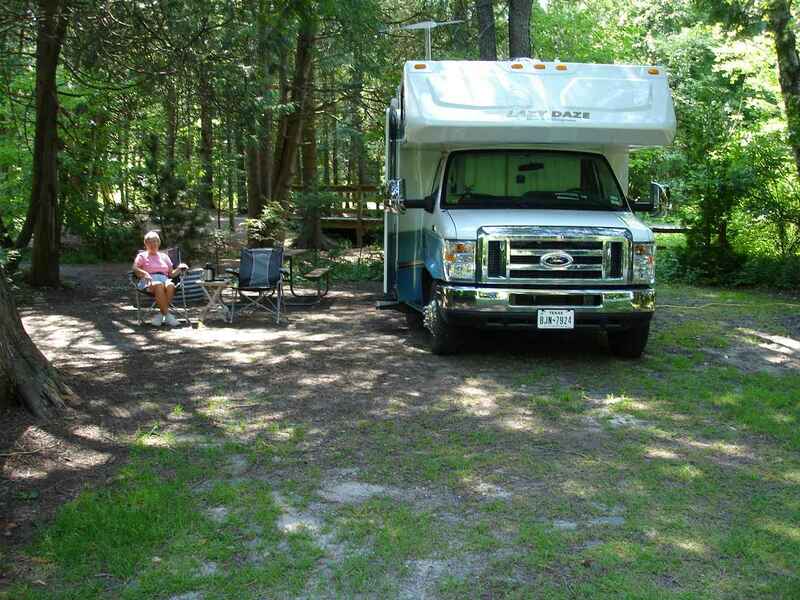 Take your RV or camping equipment and visit the national parks, state parks, and national forests across the United States. We stayed an extra day at Itasca while the rains moved through. 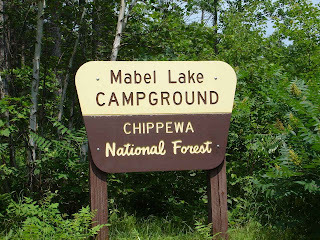 The plan was to head to Wisconsin, but how could we not stop at a National Forest campground on a lake. 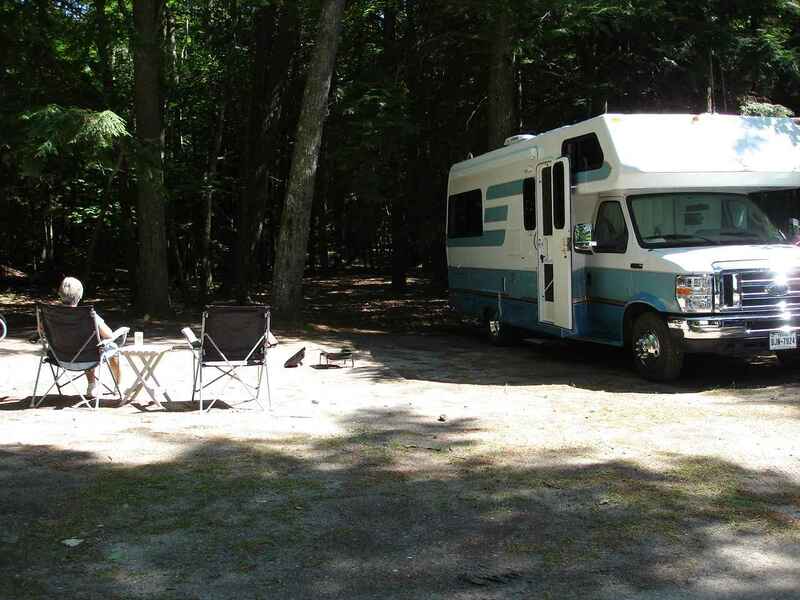 We are doing our best to be sure we arrive on Cape Cod for family camping August 10th. 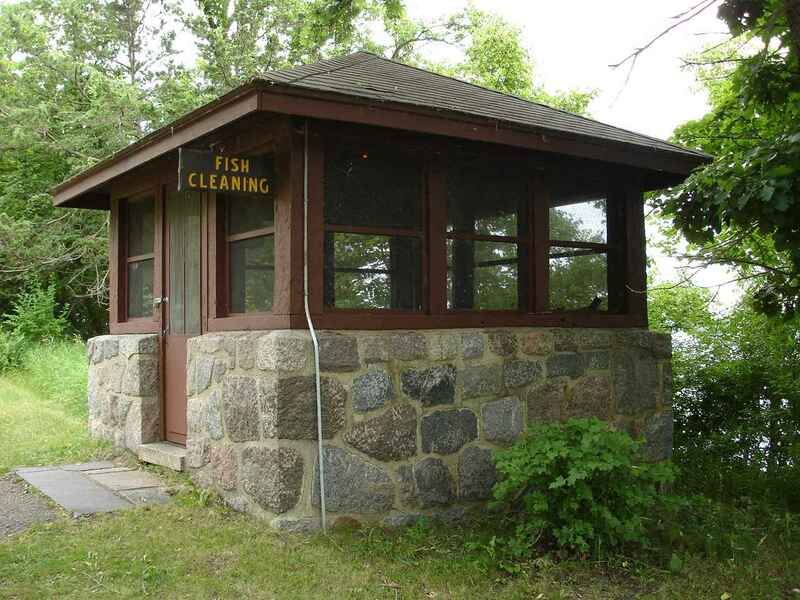 Not an easy task when we have these $7 per night spots right on a beautiful Minnesota lake!